Our equity analysts published Hidden Gem - Dec 2011 research report with Buy recommendation on Cera Sanitaryware (BSE Code: 532443, NSE Code: CERA) and shared it with all Hidden Gems members. Research report was published 2.25 years (28 months) back on 24th Dec'11 and Buy was recommended on Cera Sanitaryware Ltd at average price of Rs. 157 with a target price of Rs 350. In last 2.25 years, stock has given more than 6 times returns to our Hidden Gems members giving absolute returns of 518% at current market price of Rs. 970. Considering strong fundamentals of the company with robust YoY growth, we added more of Cera Sanitaryware in our Wealth-Builder portfolio later at price range of 350 - 450. We have not suggested any profit booking in this stock so far and its a 6-bagger stock for our Hidden Gems members. Today, Cera Sanitaryware has made all time high of Rs. 975 and closed at 962 in NSE stock exchange. Company declared its 4th quarter results on 25th Apr'14. Net profit of Cera Sanitaryware rose 38.84% to Rs 19.34 crore in the quarter ended March 2014 as against Rs 13.93 crore during the previous quarter ended March 2013. Sales rose 38.14% to Rs 218.19 crore in the quarter ended March 2014 as against Rs 157.95 crore during the previous quarter ended March 2013. For the full year, net profit rose 12.33% to Rs 51.91 crore in the year ended March 2014 as against Rs 46.21 crore during the previous year ended March 2013. Sales rose 36.04% to Rs 663.69 crore in the year ended March 2014 as against Rs 487.87 crore during the previous year ended March 2013. Cera Sanitaryware had a price hike of 4-12% across its all product categories at the end of Dec’13 quarter, which helped the company to achieve operating margins of 16.12% in Mar’14 quarter from 13.12% in Mar’13 quarter and 12.86% in Dec’13 quarter. It’s good to note that despite the price hike, the company has still been able to report good growth in sales. This indicates that company has the pricing power for its product range under the brand Cera. Company has also announced a dividend of Rs 5/- per share with dividend payout of 12.19%. We advise all our members to continue holding Cera Sanitaryware Ltd in their portfolio. Note: Its important to diversify your small cap stock portfolio, you can't just bet on one or two stocks. Our objective is to protect & grow your capital giving 100% to identify best of Hidden Gems but we do not guarantee similar returns from all our recommendations. Few of our Hidden Gems can perform better in a lesser span of time, few may take more time and need to hold for longer period. Below is the summary of Cera Sanitaryware Ltd published in our Hidden Gem research report - Dec'11. Launched in 1980, Cera is a pioneer in the sanitaryware segment in India. The first sanitaryware company to use natural gas, Cera has been on the forefront of launching a versatile colour range and introducing the bath suite concept. It also launched innovative designs and water-saving products. The twin-flush model launched in India by Cera for the first time, reduces the water needs of households considerably. WCs designed to flush in just 4 litres of water is another notable innovation by Cera. Based in Kadi, Gujarat, Cera Sanitaryware Ltd. uses International technology, which has ensured Cera’s superiority over others in quality. Established with an initial capacity of 3,600 MTPA, the plant has undergone several periodical upgradations and modernisations to expand to 25,000 MTPA. To achieve growth in the rapidly changing retail market in the country, Cera, has launched its one of a kind Cera Bath Studios in Ahmedabad, Bangalore, Chandigarh, Kolkata, Cochin and Hyderabad, Mumbai. With the opening of the Cera Bath Studios, the discerning consumers, architects and interior designers can have full view of the Cera’s premium ranges of WC’s, Wash Basins, Shower Panels, Shower Cubicles, Bath Tubs, Shower Temples, Whirlpools, CP fittings etc. 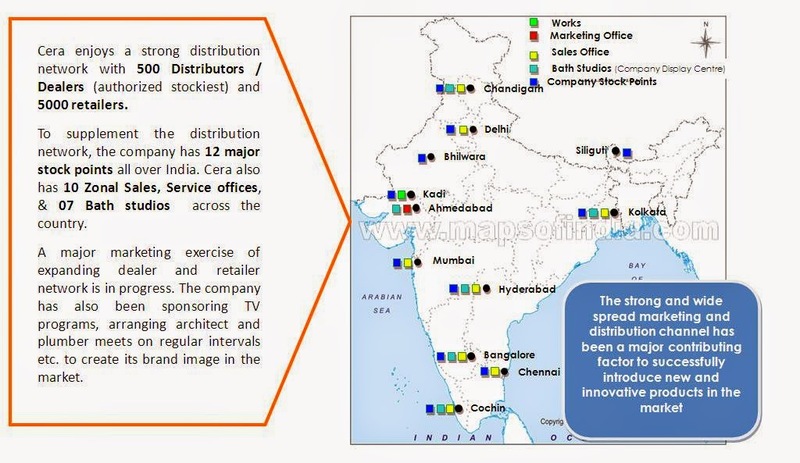 Cera Bath Studios will complement its existing network of 600 dealers and 5000 retailers. Several Bathrooms are displayed live, so that the customers can get a feel of Cera’s vast range of products. Having shown a growth rate of more than 25% since last 3 years, Cera Sanitaryware Ltd. today is the fastest growing sanitaryware company in India. For its contribution towards the industrial growth, Cera's ED 'Mr. Vidhush Somany' received "The Nirman Ratna Award" in September 2010. 1. For Cera there are two revenue streams. Manufacturing and Outsourcing. The company manufactures sanitary ware locally, while it outsources bath ware and faucet ware. 2.The company has registered a good growth of 19% CAGR over the last 5 years in the Sanitaryware segment. This is well above 12-13% industry growth. 3. In the Outsourced premium segment, the growth has been more spectacular at 33% CAGR over the last 5 years. Outsourcing doesn’t require the company to set up a plant and therefore it’s relatively easier to scale up and test market the products. 1. In the Sanitary ware segment both the raw materials and the Power and fuel are the major inputs. Over the last 5 years, while the cost of raw materials has not increased much, the energy cost has gone up substantially. 2. In case of Cera the company has been able to pass on any major increase in input price without much lag, while it doesn’t have to reduce the prices in case the commodity prices go down. A sign of both the branding power and efficient management. Cera Sanitaryware looks at acquisition in Italy, Oct 13, 2011. Cera Sanitaryware Ltd, the third largest sanitaryware maker in India, is in talks with a number of companies to acquire a brand and a factory in Italy. Cera's board of directors is likely to take a decision on this by next year. Apart from this, the company is also in the process of expanding its manufacturing facility at Kadi in North Gujarat involving an investment of Rs 100 crore over the next couple of years. With a view to catering to high end sanitaryware segment in India, we are looking at acquisition in Italy. This would be the first acquisition by Cera outside India," said Vidush Somany, executive director, Cera Sanitaryware Ltd. However, he did not disclose the size of the acquisition and the names of the Italian companies that Cera is in dialogue with. According to Somany, the company is looking at acquiring either a brand or a factory or brand and factory both. Apart from this, the company may also buy out a research and development (R&D) studio. Cera has been scouting for a suitable company for almost a year. Cera, which currently enjoys 21-22 per cent share in Rs 1500 to Rs 1800 crore organised sanitaryware market in India, is increasing the production capacity of its sanitaryware division at Kadi facility from current 2 million pieces to 2.7 million pieces. The expansion is slated to be completed by April 2012. In addition to this, the taps manufacturing division will see its capacity going up almost three times to 2 million pieces from current 0.7 million pieces over the period of next 12 to 18 months. "For sanitaryware division around Rs 60 crore will be infused, while for taps capacity increased Rs 40 crore would be pumped in," said Somany adding that the company is eyeing to capture 25 per cent market share by next year. The company is also aggressively entering into luxury segment of shower enclosures, shower trays and equipped panels and cubicles. It has also tied-up with Italian company Novellini for this. At present the company is the third largest player in Indian sanitaryware market with 21-22 per cent market share, while Hindustan Sanitaryware and Industries Ltd (HSIL) is on top with 41 per cent followed by Global giant Roca Bathroom Products Pvt Ltd with 26 per cent. 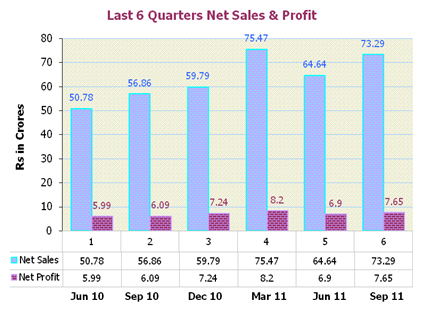 Net profit of Cera Sanitaryware rose 25.62% to Rs 7.65 crore in the quarter ended September 2011 as against Rs 6.09 crore during the previous quarter ended September 2010. Sales rose 28.90% to Rs 73.29 crore in the quarter ended September 2011 as against Rs 56.86 crore during the previous quarter ended September 2010. Net profit of Cera Sanitaryware rose 15.19% to Rs 6.90 crore in the quarter ended June 2011 as against Rs 5.99 crore during the previous quarter ended June 2010. Sales rose 27.29% to Rs 64.64 crore in the quarter ended June 2011 as against Rs 50.78 crore during the previous quarter ended June 2010. 1. Over the last 1 year the raw material prices and the prices of other key inputs have increased, while on the same hand the global economy is slowing down. The company could be in for some tough times over the short term. 2. In view of the inflationary environment, the RBI has continued with its monetary tightening. The same is hurting the growth and more specifically that of Real estate. The sale of Bath fittings is directly proportional to growth in real estate as replacement demand commands a very small share. 3. Jaguar and other local and foreign brands are trying their hands at Indian Sanitary ware market. Jaguar has a very strong brand identity and distribution network. We believe it could come across as a major competitor to the established players. 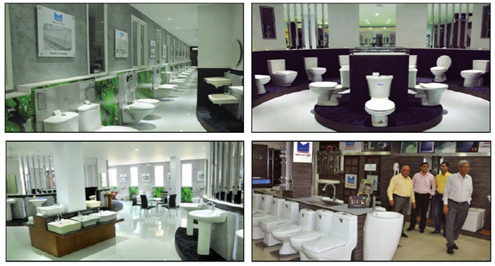 Strong Brand Equity – In the sanitary ware segment, there’s strong brand identity against that in Tiles segment. At present there are only three major players i.e. HSIL, Parryware Roca and Cera. Cera’s achievement of 20% + market share is commendable in the light of the fact that Cera started almost 20 years later than HSIL and 30 years later than Parryware. Strong Marketing & Distribution network – Cera sells it’s products through a marketing network of 500 dealers and 5000 retailers spread across the country. It’s difficult to replicate such a network and is one of the major business moats for Cera against the onslaught from foreign players and other local players. Relatively slowly changing industry - It’s a relatively slow changing business (makes it easier for us to hold it for long term in comparison to education or technology stocks where the trends change very fast and thus a company doing well today may end up on a losing side in a very short period of time). No Institutional holding - There’s no institutional holding in Cera, probably because of low liquidity. There is a very high probability the stock can get re-rated to higher PE multiples once it comes in sight of smart investors. At present the stock is quoting at 6.8 times trailing twelve months earnings. Very attractive valuations – Murugappa group sold of their 47% stake in Parryware-Roca joint venture in 2008 for a sum of Rs 720 crore while the company had recorded a turnover of Rs 360 crore for FY 08, thus valuing the company at 4 times its annual turnover. Cera’s market cap is approximately equal to its annual sales. Though not 4 times, however Cera can still get re-rated to twice the annual sales considering its efficiency and growth. Regular Dividend Income – Since 2002, company has continuously rewarded its share holders paying regular dividend. Management has increased the dividend payouts every year from 2003. In last 8 years, dividend payout is increased by almost 9 times from Rs. 0.30 per share in year 2003 to Rs. 2.50 per share in 2011.
i) Cera Sanitaryware net sales have grown at a rate of 26% on yearly basis during last 6 years whereas industry growth average is around 12-13%. Being into manufacturing sector, Cera commands higher margins, operating margins are at 20% and PAT margins are above 10%. PAT margins improved significantly from 4% in FY 2005 to 10.4% in FY 2011.
ii) Cera has achieved sales growth of 26% during last 6 years without any major equity dilution or debt funding and now it’s a debt free company. Moreover, company is evaluating various parameters for an acquisition opportunity in Italy. iii) For FY 2011, company has achieved 100% capacity utilization and in view of strong demand, it is increasing the production capacity of its sanitaryware division at Kadi facility from current 2 million pieces to 2.7 million pieces. The expansion is expected to be completed by April 2012. In addition to this, the faucetware manufacturing division will see its capacity going up almost three times to 2 million pieces from 0.7 million pieces over the period of next 12-18 months. iv) Cera Sanitwaryware Ltd is consistantly paying dividends since 2002 to reward its shareholders. In last 10 years, dividend payout is increased by almost 9 times to Rs 2.5 per share in FY 2011 compared to Rs. 0.30 per share in FY 2002. Visibility of robust earnings in FY 2012-13 on account of increased production capacity, acquisition opportunity in Italy and increase in housing demand due to softening of interest rates makes CSL a good buy at current market price for investors who can hold it for period of 12-24 months. v) At current market price of Rs 166.40, dividend yield works out to 1.5%. On equity of Rs. 6.33 crore the estimated annualized EPS for FY 2012-13 & FY 2013-14 works out to Rs. 32 and Rs. 44 respectively. Book value per share is Rs. 88.15 and at CMP of Rs. 166.40, stock price to book value is 1.89. Currently, the scrip is trading at 5.2X FY 2012-13 and 3.8X FY 2013-14 estimated earnings which make CSL an attractive bet at CMP. Considering ongoing expansion, healthy operating margins with effective brand positioning and pricing power, better earning visibility on account of robust demand and strong marketing and distribution network, Saral Gyan Team recommends “BUY” on Cera Sanitaryware Ltd for a target price of Rs. 350 over a period of 12-18 months. Click here to read/download Cera Sanitaryware Ltd (Hidden Gem - Dec 2011) research report. An opportunity missed an opportunity lost. Create Wealth-Builder portfolio by investing in Hidden Gems and Value Picks of stock market. Subscribe now and start making educated investment decisions based on facts, click here for details. Wish you all happy & safe investing!